There are many aspects of an individual’s personality that can make him- or her a good fit for a career in voiceover. Obviously the tone, strength, and talents of voice are among those, but there is also the matter of running a business to consider. Starting a career in voiceover means managing a small business (even if that business includes only one employee – the artist). For that reason, organizational skills are very strongly desired within the voiceover industry. A schedule can quickly become overwhelmed with the various voiceover work, business necessities and regular marketing objectives. Staying organized in order to balance all of that is essential. 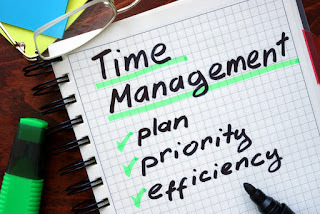 If you are struggling with time management, then now is the time to declutter your professional life and to start applying new organizational techniques to get things back on tract. Decluttering does not mean letting go of work commitments, but rather truly and physically decluttering the world around you. A neat and clean workspace will reduce stress levels, which means less time spent feeling overwhelmed by it all. Lists are also a very important element of organization. Knowing that you have a lot to do, you are likely to get bogged down trying to recall it all and make sense of it. Writing it down can free up your mind, so you can focus on one thing at a time. Once the list is made, it is time to prioritize. Be sure that you list priorities based on what is best for the health of your business. That undoubtedly means finishing work in a timely manner, but it also means setting aside time to take on the marketing tasks that will ensure you can continue to attain paying work. Place emphasis on those activities that make money or will lead to future financial gains. With the tasks to be completed listed in order of priority, you can being to break down your day. By specifying what each hour in the day will be used for, you will find that your days are much more productive, and items can be checked off the list much faster. Just remember to write in time for this type of organizational activity at the start of each week! informative post! I really like and appreciate your work, thank you for sharing such a useful facts and information about managing work stress strategies, keep updating the blog, hear i prefer some more information about jobs for your career hr jobs in hyderabad .